Can't find all of the information you need? Check out our frequently asked questions and answer section below. If you still need assistance, call our office with your questions. How can I get to the ship (transportation)? Do children get a discount? Is there childcare onboard the ship? How often can I eat? Can I purchase a Private Event Pass separately? Are pets allowed on the ship? What is the policy for name changes? What Suggested Hotel Should I Stay at prior to the cruise? What are some of the Top Chef Events? Is there a gym and/or spa onboard? So I need to be 21?/Are there age restrictions? May I film or take photos at the event? What's not allowed to bring onboard? Will Chef's be selling merchandise onboard? How will we be broken into groups? How will my seat in the theater be assigned? For US Citizens: If you do not have a passport, you will need to provide a state issued birth certificate, and a valid government issued photo ID. For Non-US Citizen's a passport is required. Please contact your local consulate to ensure you have the proper paperwork. Airfare or Ground Transportation to Miami, Florida. Transfers from the Airport to the Cruise Ship. Personal expenses such as photos, souvenirs. Sodas, bottled water or alcoholic beverages (except at our one hour on board open bar. ); meals in any of the specialty restaurants, any add on events that may be made available at a future date. The ship leaves from the port of Miami. You can get to Miami by plane, car, or bus. The Port of Miami is approximately 25 minutes from the Miami airport and approximately 45 minutes from the Ft. Lauderdale airport. A taxi or shuttle bus can be taken from the airport to the cruise port. For more information on Transportation please see our transportation page. Rose Tours is not responsible for any air or travel booked to get to Miami or the pier. Yes. Children aged 2 through 12 will receive a $400 discount when traveling with 2 full paying adults. Under the age of 2 is $299 plus $299 port taxes, fees and gratuities. Please contact rose tours if booking a child under 2. Anyone under 8 months is not recommended for travel.To recieve the children's discount, please book your stateroom and pay the deposit. Then contact Rose Tours for your discount. Guests are required to be 21 years old (on embarkation day) to travel. Guests under the age of 21 must be accompanied in the same stateroom by an adult or guardian 21 or older or with a parent/guardian in an adjoining stateroom. The exceptions Celebrity will make to this policy are: Married minor couple - The booking must be documented that the couple is married. The couple must have proof of marriage at embarkation or they will be denied boarding without the benefit of a refund. Children under 2 are not permited in the show room for Top Chef Events. Breakfast, lunch, and dinner are served everyday in the formal dining room and on the Pool deck. Food is also served 24 hours a day through room service. Top Chef inspired food items will be available at most meals. This is dependent upon your personal spending habits and budget. Optional daily photographs range from $5-$20. Shore Excursions/Tours range from $20-$150 per person. Spa services range from $30 and up. According to your personal budget, set aside money for optional expenses like souvenirs, sodas, alcoholic beverages, and personal items. A full casino is available to all guests 18 and over. Games include: 6 Blackjack tables (including one single deck Blackjack table), American Roulette, 3 Card Poker, Electronic Poker Pro (Texas Hold 'em), Craps table and 196 Slot Machines. Should a guest require medical attention while onboard, the Infirmary staff is available to assist 24 hours a day. The Infirmary is equipped to treat minor non-emergency matters. Physicians are available to render services at a customary fee. While at sea or in port, the availability of medical care may be limited. No. It's a part of the cruise package deal only. We recommend that you book your air as follows: ** On Thursday, April 11, 2013 book flights that Arrive into Miami no later than 1:00PM or Ft. Lauderdale no later than 12:00 PM** On Monday, April 15, 2013 book flights that Depart from Miami no earlier than 12:00 noon or Ft. Lauderdale no earlier than 1:00PM. No pets will be allowed onboard ship, with the exception of seeing eye dogs or service animals. Cancellations made through 11/13/12, incur the loss of the initial deposit. Cancellations made from 11/14/12 -2/10/13, incur a penalty of 50% of your total price. No refunds will be given to cancellations made after 2/10/13. If you have taken insurance and you need to cancel for a covered condition, you can make a claim with the insurance carrier to recover any lost payments. 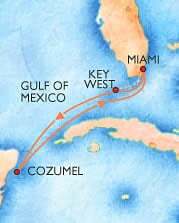 What suggested hotel should I stay at the night before near the Port of Miami? We have arranged for a special rate on April 10, 2013. More information, can be found on our Pre Night Hotel Page. All pricing information can be seen on our Prices, Payments & Policies page. Quickfire challenges, top chef events, Top Chef Inspired Dishes at most meals, etc. There are two standard pools, one whirlpool, and one kid pool onboard. Is there a gym and/or a spa onboard? Yes, the gym and spa will be available to all guests. Spa treatments, and certain gym programs may come at additional costs. Do I need to be 21/Are there age restrictions? The cruise is all ages, but guests under the age of 21 must travel in the same stateroom as an adult 21 years of age, or a parent/guardian in an adjacent room. Gratuities are covered in your Port Taxes, Fees and Gratuities. Cameras are welcome at all events, but video is not welcome during any performances. DSLR Cameras are not permitted at any event. Celebrity does not allow any illegal substances onboard, nor any weapons or firearms. Merchandise will be sold onboard. Guests will be able to purchase merchandise using their SeaPass card, which will be linked to their cabin and onboard spending account. All guests will be assigned a seat in the Celebrity Theater for reserved events. Some events in the showroom may be GA and will be noted on your itinerary. All other events onboard will be GA (except otherwise noted). Some events will be in limited capacities and will be first come first serve. The Celebrity Theater holds half the capacity of the Constellation. Events in the theater will be done twice, so all guests have an opportunity to see them. Guests will be broken up into two groups based on their dining time. Guests with early dining will be in group A. Guests with late dining will be in group B. You can only attend reserved events in the show room when it is for your group. Some events in may be General Admission. These events will be clearly labeled in your itinerary, which you will receive about 2 weeks prior to the cruise. How will my space in the showroom be assigned? Suites and Celebrity Concierge Class staterooms are assigned seats first within the first 15 rows. All other staterooms will be assigned spots in the showroom according to their time of booking. Early dining is 6:00 PM. Late Dining is 8:30 PM.